A handful of iPad minis with retina display, in silver and space gray. The retina iPad mini now bests all of its competitors in pixel density at 323ppi, barely edging out Google's latest Nexus 7. It ties the Galaxy Tab 8.0 for thinness, though it's the heaviest of the bunch (the 4G LTE version is still a hair heavier, at 0.75 pounds). 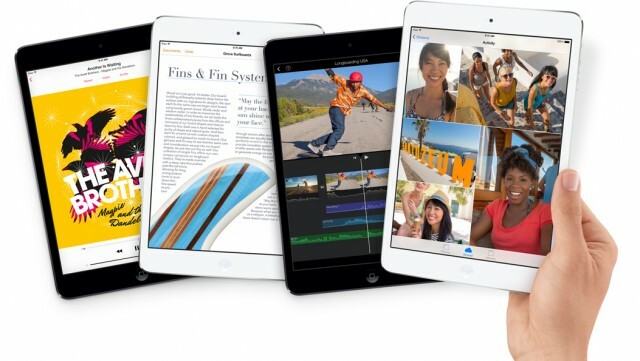 The iPad mini with retina falls to the middle of the pack for battery life, and its front-facing camera is among the lowest in resolution. For the rear-facing camera, it appears the tablet gods have decided the 5MP shall be the number of the counting of megapixels for this generation. Per usual, Apple has been tight-lipped about both the mini's and Air's internals, save to say that they are both packing a version of Apple's 64-bit A7 processor.